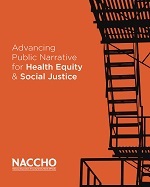 Advancing Public Narrative for Health Equity and Social Justice is a handbook that provides guidance in identifying, examining, and countering dominant public narratives and the systems that support them. Relying on examples, exercises, and questions for reflection and dialogue, this resource supports public health practitioners and their allies in becoming effective narrative strategists, as they strive to achieve health equity. The handbook also offers insights to promote a social justice-based public narrative to realize a more equitable and socially just society by engaging people in collective action. It is recommended for use in a facilitated dialogue process.